Environment Canada Senior Climatologist Dave Phillips said a “good many millions of Canadians” will be affected by this particular storm this week. “It’s sort of the lull before the storm, but we’re going to get another blast,” he told CTV News Channel on Monday. The Colorado low is tracking north to southeastern Ontario where the entire region is under a winter storm watch or a special weather statement by Environment Canada. In Toronto, the weather agency’s special weather statement is calling for 15 to 20 centimetres of snow and ice pellets on Tuesday morning before switching over to freezing rain in the evening. CTV’s Your Morning meteorologist Kelsey McEwen said the timing is poor for the Greater Toronto Area because the falling snow will impact the morning rush hour and the freezing rain will affect the afternoon commute home. The same Colorado low is then expected to make its way east to the Ottawa area where it will dump even more snow on the region. Environment Canada said Kanata, Orleans, Richmond and Metcalfe could receive snowfall amounts of 30 to 40 centimetres on Tuesday and into Wednesday. In southern Quebec, there are winter storm watches for most of the region, including Montreal. 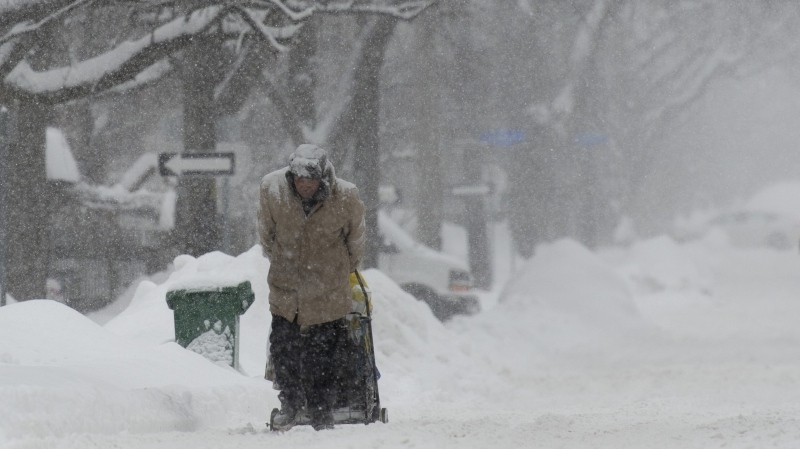 Environment Canada said the city could see 20 to 40 centimetres of snow along with blowing snow. McEwen said Quebec City and the regions north of it will be some of the hardest-hit areas when the snow arrives there in the late afternoon to early evening. “I think north of Quebec City we’re going to get into 50-plus centimetres of snow,” she said. Nova Scotia, too, is under a special weather statement with a “mixed bag” of precipitation expected for most of the province. McEwen said it’s still too early to predict exact snowfall amounts in the Atlantic Provinces because they’re still a couple of days out from the storm. Eventually, the storm system will travel to P.E.I. where the island is under a similar special weather statement as New Brunswick and Nova Scotia. By Wednesday night, McEwen said the low-pressure system should reach Newfoundland and Labrador.